2014 looks to have been a positive year for IAG on its path towards value-creating returns. Vueling was part of the group for its first full calendar year and remained IAG's most profitable and fastest growing business; Iberia returned to capacity growth and to profit; and British Airways completed its first full year of operating the A380 and the Boeing 787. In some ways, all of Europe's Big Three legacy airline groups have been doing broadly similar things in recent years, namely restructuring their network airline businesses and seeking growth opportunities through lower cost point to point operations. However, IAG's execution in both of these areas has been better and this has led to its superior profit performance compared with the other two. The year culminated with IAG's offer to buy Aer Lingus. The bid was rejected (it will likely come back), but further confirms IAG's leadership among the Big Three, not only in terms of financial performance, but also in strategic confidence to pursue consolidation. In this report, we review IAG's main strengths, weaknesses, opportunities and threats. Although originally formed from the merger of British Airways and Iberia in 2011, the structure of IAG is unlike the typical merger of two companies, or the acquisition of one by another. IAG was created with a central holding company in order to separate the central group management from the management of the operating airlines and to facilitate further acquisitions. The acquisition of Vueling in 2013 demonstrated the merits of this approach. While the Group gives consideration to the potential for cooperation and synergies between its subsidiaries, the structure allows each airline to operate separately and undisturbed by central group activities. Decisions about the allocation of capital and other resources and about performance targets for each company can be taken centrally, without the bias that may colour decisions in groups where the parent company is also one of the operating businesses. The key North Atlantic city pair, London-New York, is the world's largest city pair by total ASKs. BA has a seat share of 38% in this market, giving it a clear lead over second ranked Virgin Atlantic's 24%. BA's JV with American Airlines has a share of 49% of seats on this city pair, compared with the Delta-Virgin JV's share of 35% (again, using data from OAG for the week of 6-Apr-2015). IAG's Iberia is the leading individual airline by seats on the South Atlantic (Europe to Latin America, excluding Caribbean), with a seat market share of 17% at the start of the summer 2015 schedule (week of 6-Apr-2015, according to data from OAG). However, British Airways is only in eighth place, with 5%, giving IAG 22%, fractionally behind Air France-KLM, which includes second ranked Air France (12%) and third placed KLM (10%). All of Europe's Big Three flag carrier airline groups have low cost airline subsidiary operations in the short and medium haul point to point markets. IAG's principal LCC, Vueling, is more independent, more pan-European and more profitable than Lufthansa's Germanwings and Air France-KLM's Transavia. Moreover, IAG has also established Iberia Express to feed its Madrid hub. While not styled as a LCC, IAG published data at its last Capital Markets Day in Nov-2014 claiming that Iberia Express has a level of stage length-adjusted CASK that is lower than those of easyJet and Norwegian. Its CASK calculation is also adjusted to exclude "business class/feeding related cost" and we cannot reproduce it to verify its accuracy. Nevertheless, while the precise CASK level of Iberia Express may be disputable, IAG has shown greater success in LCC operation, both through acquisition and through establishing a new business, than either of Lufthansa or Air France-KLM. At its Capital Markets Day in Nov-2014, IAG CEO Willie Walsh was asked what advice he would give his counterparts at Lufthansa and Air France-KLM. His reply is informative when considering IAG's better progress with restructuring its legacy businesses. "You've got to be clear about what you are trying to achieve, " he said, "and have the determination to do it". One of the reasons why IAG's financial performance has moved ahead of that of Lufthansa and Air France-KLM is that it confronted labour restructuring issues more squarely and earlier that they did. Even before the creation of IAG, British Airways faced down union opposition to changes in terms and conditions for cabin crew. This provoked a series of strikes in 2010 and 2011, costing BA tens of millions in lost revenues and a serious dent to its reputation. Nevertheless, while there was some negotiation and concession around the edges, BA essentially stuck to its guns and achieved its main aims. IAG has also applied his uncompromising approach to BA's sister carrier Iberia. Iberia too was hit by a series of strikes early in its restructuring, which involved significant headcount reduction and wage cuts. While a mediator introduced some moderate softening of IAG's initial stance, Mr Walsh played hard ball. IAG also made it plain that Iberia would not grow until it could demonstrate that growth would be profitable. Moreover, in setting up Iberia Express and acquiring Vueling, IAG created alternative paths that concentrated minds at Iberia. Not only has IAG been able to reap the benefit of improved productivity, but it has also both avoided strike-related costs and gained from strikes at its rivals in 2014. British Airways' hub at London Heathrow is one of the highest yield markets in world aviation. London is a very large O&D market, involved in all of the top five international city pairs by ASKs, to New York, Dubai, Hong Kong, Singapore and Los Angeles (on an airport pair basis, Heathrow is in five of the top six by ASKs). Heathrow is also a very strong market for premium passengers. More than 17% of seats at the airport are in premium cabins (including premium economy), compared with an average of less than 8% globally (week of 5-Jan-2015, source: OAG). Pricing is further supported by Heathrow's constrained capacity. Although the full group name, International Consolidated Airlines Group, is somewhat uninspiring, it allows the operating brands to retain their own individual characteristics. All three of IAG's brands are strongly positioned in their respective markets. British Airways remains the leading premium airline brand in the UK, while Iberia is the most widely known airline brand in Spain (according to a Millward Brown survey measuring spontaneous brand awareness, Jan-2014). Vueling, while number three behind Ryanair in this list, has a brand with a stronger customer service perception and a reputation for offering more premium features than other European LCCs. Although IAG's share of the overall and international market in Spain is quite weak, its position is stronger in the Spanish domestic market. Iberia is first, with 32% of seats, and Vueling second, with 27%. IAG's combined 59% share is comfortably ahead of Air Europa's 17% and Ryanair's 14%. Ryanair is the largest individual airline overall in Spain by seats in the summer schedule, with a share of 19% (according to OAG data for the week of 6-Apr-2015). However, second placed Iberia (14% of seats) and third placed Vueling (13%) combine with British Airway (2%) to make IAG the leading airline group in Spain, with a share of 29%. On international routes, Ryanair's 21% share of seats is greater than the combined share of Iberia and Vueling, although BA's 2% gives IAG as a group a slight lead. IAG's target for return on invested capital (ROIC) in the 2016-2020 period is 12% or more, both for the group and for the individual operating companies. This equates to an operating margin target in the range 10% to 14%. Its operating margin was 4.1% in 2013 and its guidance/targets for operating profit in 2014 and 2015 imply margins in excess of 6.5% and 8.5% respectively. While on a clear upward path, IAG's current level of profitability falls short of its required levels. This is particularly the case for Iberia, which was loss-making in 2013. Although it is very probable that Iberia will report a positive operating profit for 2014, having returned to profit in 9M2014, its 9M operating margin of 2.1% was still considerably lower than the 8%-10% for BA and Vueling. In an industry where demand is notoriously cyclical, this still insufficient level of profitability for the group leaves it exposed to any downswing in the cycle. In spite of the labour productivity gains at British Airways in recent years, and its reduction in unit costs, it remains among the higher cost European airlines, as measured by cost per available seat kilometre, when account is taken of its average trip length. The scatter plot below, of CASK versus average trip length, shows that BA sits further above the trend line for European full service carriers than does Iberia. Moreover, there are a number of European FSCs sitting below the trend line, ie with more efficient cost structures than both BA and Iberia. While BA in particular may generate a premium in its unit revenue (revenue per ASK, RASK), this relatively high cost structure leaves it vulnerable to a demand downswing (even if the strengths of the London Heathrow market may mitigate the impact to some extent). A further concern arising from this CASK analysis (but not shown on the chart below) is that there are long haul carriers based in the Gulf and in Asia that not only have CASK levels that are comfortably below the European FSC trend line, but also have a very high quality product. As noted above, BA's Heathrow hub is a strength to the extent that healthy London O&D demand, particularly from premium traffic, helps yields. Nevertheless, the lack of spare capacity at the airport constrains growth and also keeps charges high. BA has managed to achieve some growth over the years through slot purchases, boosted in 2013 by the acquisition of bmi. As a group, IAG group has growth options through Iberia in Madrid and Vueling at Barcelona and its other bases. However, Heathrow's lack of growth capacity means BA is increasingly dependent on slot trades, which are often expensive. Ironically, if the UK airports commission does recommend new runway capacity be built at Heathrow, and if the UK government has the political courage to implement the recommendation, this could become a bigger problem for BA as it would very likely lead to further significant increases in the airport's already high charges. IAG's international network is relatively weak in the Asia Pacific region. In particular, Iberia does not operate to the region at all. British Airways share of seats between Europe and Asia Pacific is around 5%, ranking it as the number five airline between the regions (week of 6-Apr-2015, source: OAG). This puts IAG in a distant third place among Europe's Big Three in this route area, with the Lufthansa Group in first place with 12% of seats (mostly through Lufthansa itself, but SWISS and Austrian also contribute) and Air France-KLM second on 10% (roughly evenly split between the two main airlines in the group). IAG is also behind Turkish Airlines (7%) and Aeroflot (6%), both of whom pursue a strategy involving the use of their main hub to attract connecting traffic in competition with the non-stop flights of BA and others. BA has pockets of relative strength, such as India, but IAG's overall position in Asia Pacific is underweight for a major global airline group, despite its oneworld partner links. This helps explain Mr Walsh's previous statements about acquiring positions in Asian airlines - and the Qatar Airways partnership. IAG's relatively weak presence in Asia Pacific, but with some historic areas of strength, provides an opportunity for future expansion. In particular, Iberia may seek to add routes into the region, rather then relying on connections through BA's London hub and codeshare partners. More specifically, IAG is the weakest of the big European airline groups in China, relying mainly on oneworld partner Cathay Pacific and its subsidiary Dragonair to access China via Hong Kong. BA's relatively new London-Chengdu route and its growing deployment of aircraft more suitable for long haul point to point missions may point the way to a growing presence in China. BA has recently down-gauged its aircraft deployment to India, improving its cost efficiency and giving it a basis for future growth. Further expansion in India may require local partners, although it may not be easy to find a suitable Indian partner. Its codeshare relationship with oneworld partner Qatar Airways, which already operates to more cities in India than BA, could lead to closer ties both in the subcontinent and across more of the Asia Pacific region. A joint venture arrangement with Qatar could provide IAG with an opportunity to exploit the region's potential more. 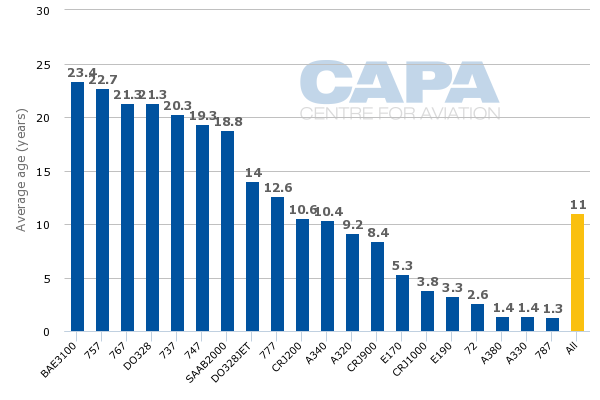 According to the CAPA Fleet Database, IAG's fleet contains a number of older generation aircraft types that are well above the average age of 13.7 years for European airlines. These include aircraft types with average ages in excess of 20 years, such as BA's short/medium haul workhorse Boeing 757-200s and 737-400/300s and its long haul Boeing 747-400s and 767-300s. The fleet also includes some regional jets that are more than 20 years old. Orders placed in 2013 for new aircraft will allow IAG to replace this ageing fleet with more cost efficient aircraft. The 737s are being replaced by A320 family aircraft, while the older long haul aircraft are being replaced by Boeing 787s, Airbus A350s and A380s. In addition A320 orders, including A320neo variants from 2017, will provide growth to Vueling and replace more costly leased aircraft. As noted above, IAG was designed not only to enable the merger of British Airways and Iberia in 2011, but also to facilitate further acquisitions. Initially, the focus was on completing the merger and weathering the ongoing effects of the economic weakness in Spain. IAG's acquisitions since then have been bmi (which was broken up and partly absorbed into BA) and Vueling, which remains a stand alone operator. With the successful addition of Vueling now well bedded down, IAG's attention is returning to the prospect of expanding the group further. Europe remains a relatively fragmented airline market, certainly by comparison with North America, where consolidation has progressed further. This helps to explain Europe's underperformance in airline margin terms. See related report: Airline consolidation: could Europe follow North America's path to improved margins? However, IAG has made good progress in improving its own margins, leading the continent's legacy airline groups, and is within sight of achieving its target levels of profitability. A European deal that is truly transformational in terms of its impact on market structure remains unlikely for now, but IAG's Dec-2014 bid for Aer Lingus offers some interesting benefits in the form of Heathrow slots and the North Atlantic market. Aer Lingus rejected the bid, but it seems likely that IAG will make a fresh one. A deal involving two of the Big Three legacy groups would be far more significant in increasing market concentration, but they all still have other priorities and would no doubt face political, labour and competition-related obstacles if any of them did try to make such a move. IAG has extracted significant benefits from integrating certain activities of BA and Iberia, although the two remain distinct operating companies. In Nov-2014, the group increased its target for the total synergies generated between 2011 and 2015 from the figure of EUR560 million given in Nov-2013 to EUR700 million. It has also taken advantage of its size in making joint aircraft procurement decisions on a group-wide basis. Nevertheless, there remain opportunities for closer integration between IAG's operating subsidiaries. For example, it has already begun a programme to harmonise its A320 fleet specification, allowing for switching of aircraft between the different airline brands and providing significant savings estimated by IAG at between EUR500k and EUR1 million per aircraft. As noted above, Vueling positions IAG firmly in the LCC segment of the market and positions it better than other European legacy airline groups to combat LCC competition. Nevertheless, growing LCC competition remains a threat to British Airways and Iberia, particularly as competitors such as easyJet and Ryanair specifically targeting the high yield business travellers that are vital to legacy airline profitability. BA's Heathrow hub remains relatively poorly penetrated by LCCs (only Germanwings and Vueling operate there, accounting for a low single digit percentage of seats). However, the UK has one of Europe's highest LCC penetration levels and short haul routes from Heathrow compete with those from all the other London airports and LCCs have a strong share of the overall London short haul market. Unlike Heathrow, Iberia's Madrid hub already features all of Europe's leading LCCs, including Ryanair and easyJet, although Vueling and Iberia Express have helped IAG to mitigate their impact. As with LCC competition on short haul, competition in long haul markets from the Big Three Gulf carriers (Emirates, Qatar Airways and Etihad) and Turkish Airlines is not going to go away. Just as IAG took action in acquiring Vueling and establishing Iberia Express to bolster its position against LCCs within Europe, it also took action to embrace Qatar Airways within oneworld in order to widen its options in facing the Gulf threat. Nevertheless, the competitive threat from the Gulf remains. For example, in addition to the direct competition on Dubai-London, the penetration of Emirates into secondary UK cities (Birmingham, Glasgow, Manchester, Newcastle) means that Dubai is increasingly an alternative hub to Heathrow for passengers travelling to the Middle East, Africa and Asia Pacific. Moreover, Emirates' planned growth in the US will position it to eat into BA's share of the connecting US-bound traffic that is so important to its Asia network (in particular India). In addition, Etihad's expansion through codeshares, augmented by equity investments, has significantly increased its footprint in Europe. Although IAG's 14% share of seats on the North Atlantic makes it the leading airline group in this market, the joint venture between Virgin Atlantic and its 49% shareholder Delta has a higher share. Although not technically a single group, the inclusion of Virgin's seats between Europe and North America with those of Delta gives the Delta-Virgin group a clear lead over IAG, with a market share of 19%. Moreover, if Virgin Atlantic were to join SkyTeam's North Atlantic joint venture, this would take it ahead of both the oneworld and Star alliance JVs to become the leading North Atlantic. To date, Virgin has shown little interest in joining SkyTeam, but IAG must consider the possibility. More immediately, the Delta-Virgin Atlantic JV has altered the competitive dynamic on BA's core North Atlantic route, namely London-New York. The combined BA-AA seat share on the city pair of 49% ranks this alliance in first place, but the combined Delta-Virgin share of 35% is closer to it than Virgin's stand alone 24%. IAG's interest in Aer Lingus (see above) suggests that it is concerned about the competitive threat posed by the Delta-Virgin combination, even though IAG publicly denies any concerns. Vueling is the highest margin business in IAG and the only profitable LCC subsidiary of a Big Three parent. However, its 3Q2014 margin fell as its rapid expansion into new markets led to costs being added faster than revenues. Expansion by Vueling in to new markets, particularly its Rome and Brussels bases, both diluted unit revenues and brought additional costs (for example costs of staff training and accommodation). Although IAG expressed its comfort with Vueling's development and the delivery of new A320 aircraft should help to improve its cost structure, any loss of focus by the LCC on growing its profitability would be a threat to the Group's ability to meet its targets. IAG's target ROIC of 12% and operating margin range of 10% to 14% would have been unthinkable as recently as 2012, the first full year after the merger of BA and Iberia, when its margin was minus 0.1%. And, although it may seem modest in comparison with the rewards its US airline counterparts are reaping, IAG does not have the luxury of operating within a competitive bubble. "…while these targets are ambitious, IAG's progress since 2012 in particular suggests that they might be within reach. Expressing goals of this nature are currently beyond the reach of the other major European legacy airline groups, Lufthansa and Air France-KLM, as they grapple with industrial relations issues and resistance to the kind of restructuring with which IAG has already made progress. It is too early to declare IAG the winner in a race that is never complete, but it is the clear leader among Europe's Big Three. The real test for IAG's ability to maintain the profitability that it targets will come from the next severe downturn, but it does seem to have constructed a business model with comparative flexibility and clarity of purpose."